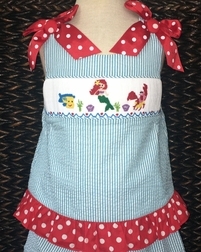 Here is Three Sisters sweet rendition of the wonderful Disney story of Ariel the mermaid who wanted to be human. 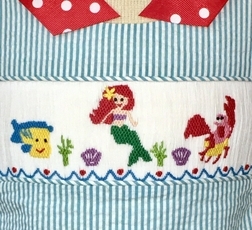 The top of the outfit is smocked across the chest with hand embroidered characters from The Little Mermaid; Ariel, Flounder, and Sebastion. 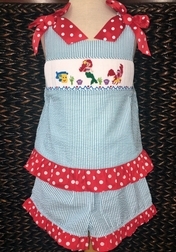 The swing top is made with a blue stripe fabric with a red with white dots fabric ruffle and covered buttons. 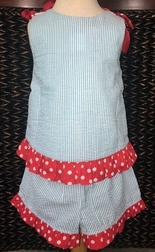 The shorts are made of the same fabric and have the same ruffle.